The Chancel Choir presented the cantata “Sing Joy to All the World!” composed by Lloyd Larson on Sunday, December 17 at both worship services. 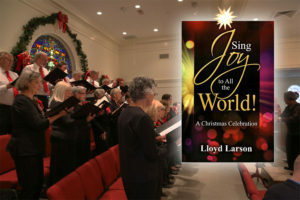 Collaborating with the Chancel Choir were William Court and Erin Reichert, narrators, Janice Creech, piano, Karen Wyld, flute, Kathleen Duncan, oboe, Lucy Scandrett, harp, and Bob Wilson, Dana Scaglione, Heaven Singleton and Don Jemella, percussion. The music was a powerful medium to bring the Christmas story into the hearts and minds of all those present. The pictures below bring you back to this wonderful hour. A big thank you goes out to all of the performers and other supporters.